Glenn D. Asks: Why Should I Replace My Hydraulic Tensioner With My Timing Belt? Glenn recently had his timing belt replaced along with his water pump on his 2006 Honda Pilot. It was suggested to him that he replace his “hydraulic tensioner” with the timing belt and water pump. It was around $80 more for the part and reluctantly agreed to replace the part. Glenn asked me : Joe did I really need to replace that part? Well Glenn you did make the right choice by replacing the hydraulic tensioner for your Pilot and I will explain to you why. 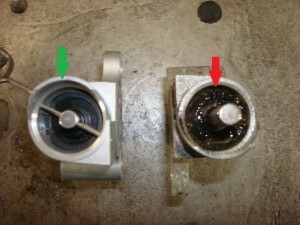 You can see I have a picture of two tensioners the new one is on the left and the old is on the right. If you look closely at the old tensioner on the right you can see where it has lost hydraulic oil and has become weak and would only become weaker. What this component does is keep constant pressure against the timing belt tensioner pulley to keep the timing belt at the proper tension. If the tension becomes insufficient the belt will loosen and jump a tooth putting the engines valve timing out of specifications. If this were to happen it would likely ruin the new timing belt, and cause significant engine damage as well. In the picture below you can see the hydraulic tensioner in its installed position. 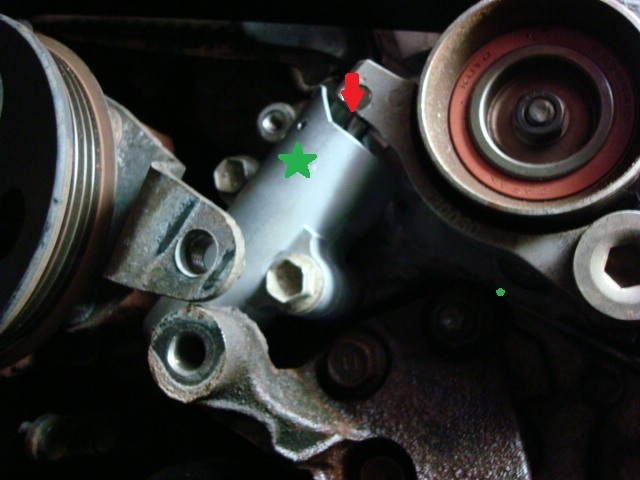 The red arrow points to the area of which the the hydraulic tensioner contacts the tensioner arm and pulley that contacts the timing belt and keeps it tight.The green star indicates the housing of the component. If the old tensioner pictured above was to be re used there would be no way that it would last as long as the new timing belt and water pump. Please be aware that not all vehicles with a timing belt use this configuration so before you have your timing belt replaced it would be worth finding out if your vehicles engine uses a hydraulic type tensioner. Green star shows the tensioner housing. Red arrow shows point of contact pressure. 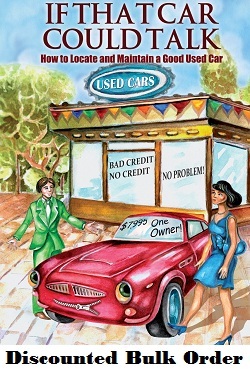 « Thank you Steve Sherman For The Great Editorial Review on “If That Car Could Talk”!